After posting The 10 Best Places To Eat in Ilocos Norte, the time has arrived for The 10 Best Places To Eat in Ilocos Sur. 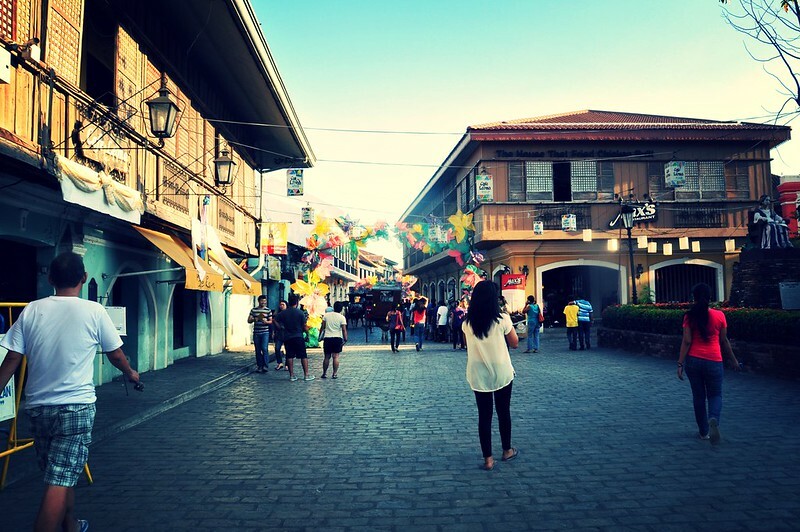 Ilocos Sur and its capital city, Vigan, is distinguished by its fascinating, centuries-old history, where traditional and inherited dishes remain. Hinged on various opinions from in-demand tour guides, frequent as well as first time visitors in Ilocos, foodies from different generations, not to mention my own personal experiences as a food blogger (who has paid 95 percent of all the food that’s been featured in this blog), the restaurants that made the top ten list best satisfy the curiosity for Ilocano cuisine and beyond. Even the most basic, simple Ilocano pinakbet or dinegdeng requires art. 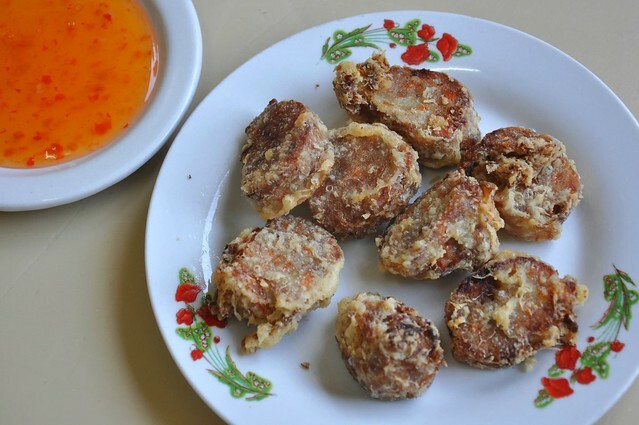 But in an evolving world, it’s also not only just about plain bagnet nor longaniza anymore. It is also how these classics are being used to create yet unmistakably Ilocano food in character. And because eating out is also about bonding moments with family or friends. 1. 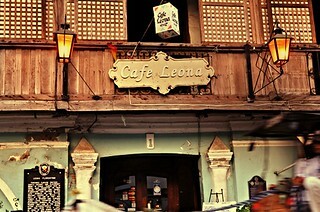 Cafe Leona. The restaurant is the first thing you see upon entering Calle Crisologo from the Leona Florentino statue and marker. Leona Florentino was an 18th century local poet in the Spanish and Ilocano languages. The mother of Philippine women’s literature was also given the title “bridge from oral to literary tradition.” You go inside the cafe and you might not like the tight, fusty setting that welcomes you, but the menu will reveal it cares about diversity. Pinakbet here is first-rate, and Vigan longaniza too, but fresh uni (sea urchin) and unagi (eel) teriyaki are also always available, and affordable. Native fish tamales, bagnet and ararosip (grape seaweed) salad are among the mainstays in the turo-turo-style counter. 2. Kusina Felicitas and Cafe Uno. While these two are situated in Grandpa’s Inn and often interchangeable, Cafe Uno specializes in short orders like salads and pastas, upgraded poque-poque, coffee, and cakes with a homemade feel and taste (carrot cake and chocolate fudge here are winners), and Kusina Felicitas, on the other hand, is known for traditional Ilocano and Filipino food and Vigan specialties such as pipian with citrusy and minty pasotes and grilled chicken with tropical karimbuaya leaves. 3. Cafe Bossa. 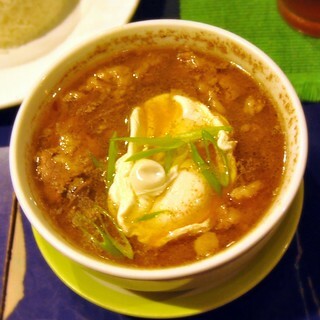 Candon’s best kept secret is Cafe Bossa’s lomo-lomo soup with pork loin and liver. Haven’t eaten lomo-lomo like this ever. Topped with one whole egg, it is rich yet soothing. The creative twists to iconic Filipino food like tuyo and aligue, among others, make this cafe unique. They also have great desserts, and it transforms into a tavern by night. It occupies the first floor of an ancestral house tucked in the commercial side of the town. 4. Bistro 23. On the corner of Calle A. Reyes and Calle Salcedo stands Bistro 23, a newbie restaurant and bar with a mouthwatering start. “Comfort food at its best,” says sales reps who travel the north frequently. In the menu, you will find pancit and it turns out it is pancit loaded with fish ball slices and topped with a sunny side up egg. Undressed Vigan longaniza sits on a bed of poque-poque, and also on fried rice. 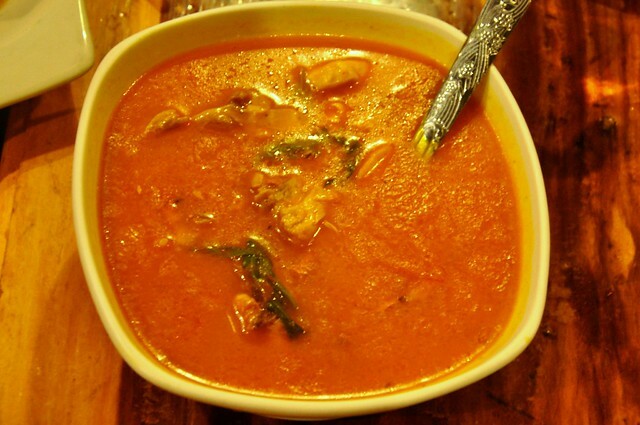 Audacious eaters can bet on kansi and bloody sapsapuriket chicken soup. 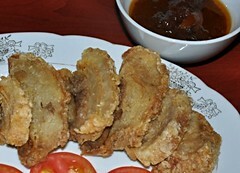 Tokwa’t bagnet sounds good and tastes good. 5. Bistro Candon. Back to Candon at Chef’s Nic Rodriquez’s home ground. Bistro Candon’s claim to fame is its traditional Ilocano fare and desserts that we’ve grown up with like chocolate cake which has attracted food editors of the Philippine Daily Inquirer, leche flan and brazo de Mercedes. Try the rellenong bangus and bagnet with Chef Nic’s fragrant taburkik bagoong. The restaurant is inside a compound and closes quite early, so lunch is best. 6. Comedor. The name alone suggests Spanish influence. Comedor is the main restaurant of the luxurious Hotel Luna, which is the only museum hotel in UNESCO World Heritage site Vigan. 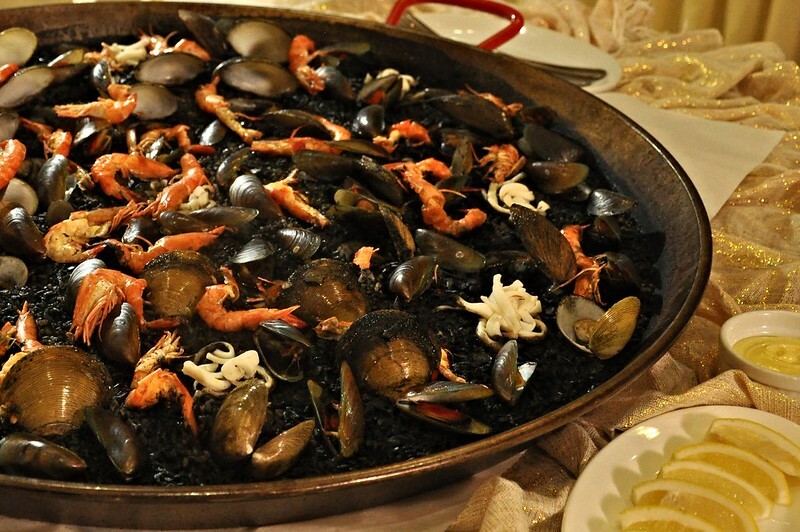 It tries to relive the affluent days with tapas and paella. Paella negra here doesn’t disappoint. Ditto with heritage dishes. Service is efficient and friendly. 7. 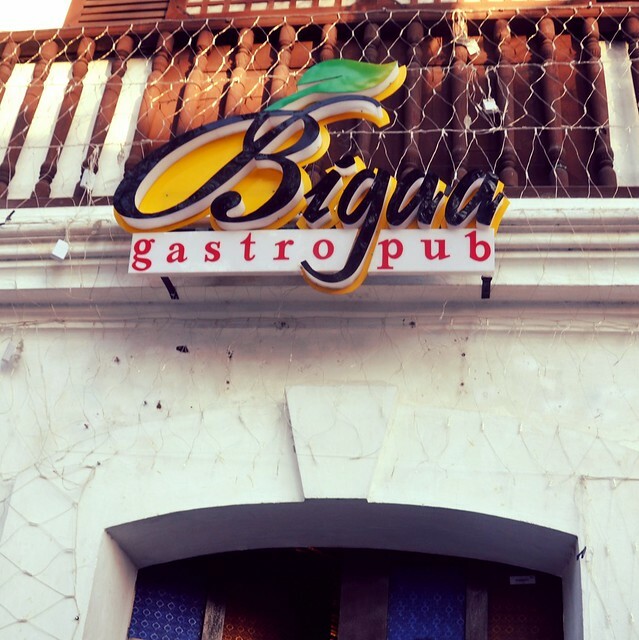 Bigaa Gastropub. What used to be a dessert shop at the Vigan Plaza Hotel has evolved with more in store for the younger palate. The divine sans rival is still as good. Along with traditional Bigueño entrées, hybrid dishes like rusangis (endemic only to Caoayan) and bagnet pastas and panizza capped with local ingredients tickle the palate. A pasta draped with provincial dinoydoy (mashed squash) is surprisingly bracing. 8. Sanitary Restaurant. The oldest restaurant in Vigan is still a crowd attraction. The little Chinese restaurant is always packed with locals enjoying lomi, mami or pancit Luzon with siopao or siomai. 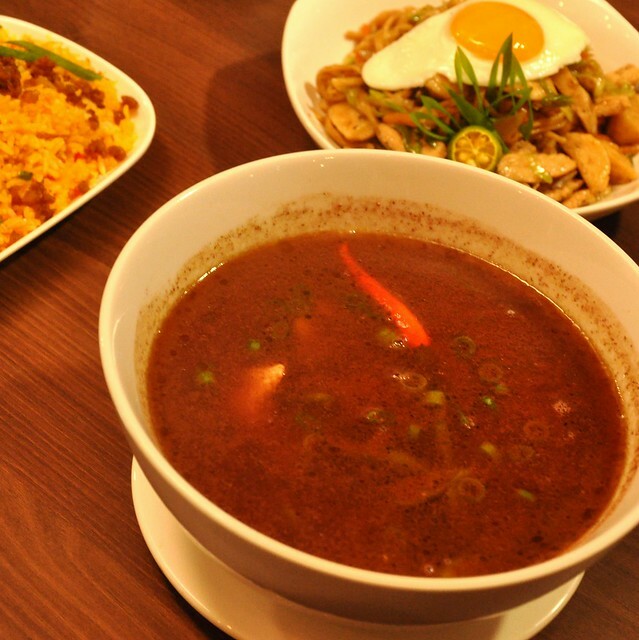 The menu consists of Chinoy-sounding food names peppered with Spanish terms like caldo and agre dulce. You can also find hongkue (Chinese stuffed chicken) in the menu, but has to be ordered in advance. It is said that a typical box of goodies brought out of the city contains bagnet, longaniza, royal bibingka and Sanitary’s famous ngoyong (ngohiong), a kind of Chinese meat roll flavored with five spices. 9. Lilong and Lilang Restaurant. The best Vigan empanada is shrouded in foliage, according to famished tourists checking out the Hidden Garden in the outskirts of Vigan. Lilong and Lilang Restaurant is the place to eat when you like restful natural environment. Ilocano favorites like dinengdeng, sinanglao, pinakbet with bagnet and warek-warek (grilled pork and liver mixed with mayo) dominate the menu. Down to presentation, local color is intensified. Buko and fruit coolers delight especially during hot Ilocos weather. 10. Pinakbet Farm. 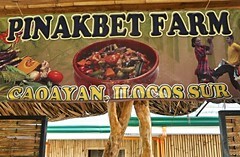 The quintessential Ilocano food gets top billing in Caoayan, not too far away from the core of Vigan. A mélange of vegetables straight from the garden, alongside freshly-caught grilled tilapia (from its own pond), chicken and pork is the only food there is at this picnic pavillion maintained by the community. An authentic farm-style ambiance that perfectly personifies Ilocano simple living, complete with Ilocano entertainment, is an experience in itself. Wow! Next time we should visit these places. Thank you! I’ve never really eaten at restaurants in my province so there’s a lot for me to discover when I go home. We always make sure to dine at home but once in a while it is nice to try something new.